The Shark Tank star investor, a self-described “guy off the boat” immigrant himself, knows the feeling intimately. When he was 8 years old, he moved with his family to Toronto, Canada, from Zbjeg, Croatia, (formerly Yugoslavia) on the heels of his outspoken father’s escape from jail in the communist country. The Herjavecs’ only belongings when they moved into an acquaintance's basement were the clothes on their backs, the shoes on their feet, $20 and a suitcase. Growing up, Herjavec often felt like an outsider, seeing his father walk two miles to and from his factory floor-sweeping job and watching his mother lose all of the family’s savings (only $500) to a swindler vacuum salesman. “I realized that compared to everybody else, we were really poor," he told Business News Daily. By the time he was 14, the ambitious future multi-millionaire decided he wanted to give his family a better life, beyond anything they "could have imagined back in Croatia." The path to that better life, he told his parents, was to be his own boss -- someone who could “never be fired or laid off,” like the factory workers his father toiled alongside. He wanted to be someone who could have “the freedom to control your schedule and to do with it what you want.” He wanted to be an entrepreneur. 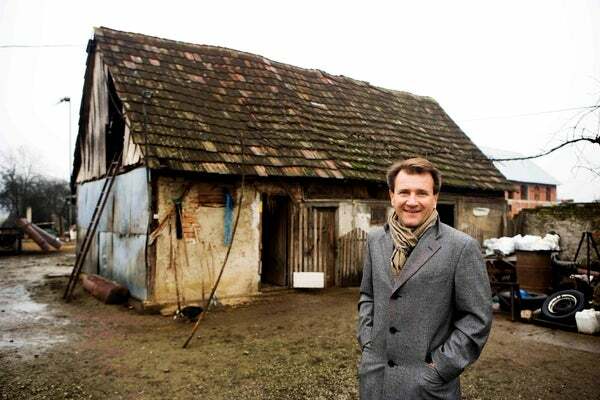 After a string of menial jobs, including waiting tables and delivering newspapers, Herjavec worked his way up and eventually did become that someone he wanted to be. With the launch of his first venture -- a tech company called BRAK Systems that he later sold to AT&T for an undisclosed but surely tidy sum -- he made his dreams come true. He was an independent immigrant entrepreneur in charge of his own financial fate, and it wasn’t a stroke of luck. It was the result of working hard to live better. He "believed" he could succeed and succeed he did, beyond his wildest dreams. To glean more of Herjavec’s advice, check out Shark Tank’s Season Eight premiere on your local ABC station. It airs on Sept. 23 at 9 p.m. ET.